Dhoti salwars are currently in fashion. They are comfortable and roomy pants and are a must have in our wardrobe. 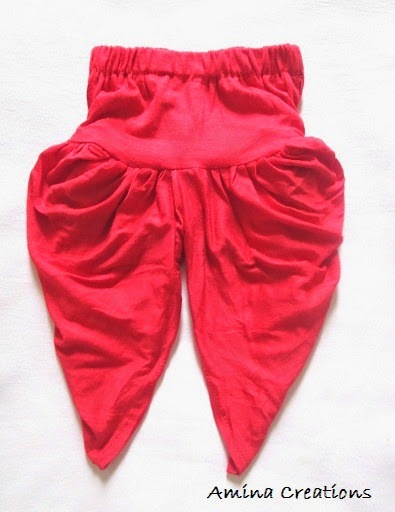 Dhoti salwars or pants are usually stitched with cotton and other soft fabrics. They can be worn with short tops or T shirts. Approximate measurements are given in brackets for reference. Take your own measurements and use it to stitch the dhoti salwar. Join b and b1 as shown. First take the required amount of cloth and open fully. Then fold it diagonally in the reverse as shown. Then mark the above measurements on the cloth. Using the above measurements cut 2 pieces one for each leg. Leave ½” allowance along a to 2 and 1” allowance along a to 3 line and 3 to 1 line and cut the cloth. Once the 2 leg pieces are cut, use the remaining cloth to cut the waist band. The construction for cutting a waist band is given below. Once the 2 leg pieces and the waist band are cut and ready, start the stitching process. First double fold and stitch the opening of the two leg pieces along cbb1. Then stitch along c to 3 line. Once the two leg pieces are ready, join them together by stitching along 3 to a line. Stitch the two ends of the waist band in the reverse till e, double fold the extra part and stitch. Now double fold on top and stitch on top for inserting the draw string making sure that the waist band after stitching has a width of 8 ½”. Once the waist band is ready, stitch the leg part to it by pleating and stitching it to the waist band starting from the centre and stopping at d and then pushing the pointed edge inwards. In this way finish pleating the entire leg part to the waist band. 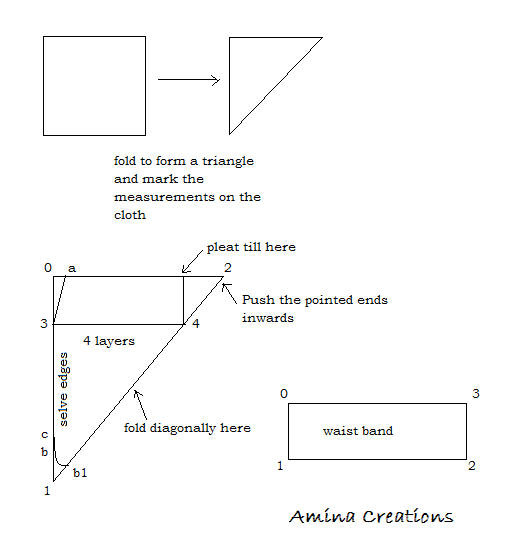 Make sure that you pleat as shown in the diagram and push the extra part as shown. This is the most important step in stitching a dhoti pant. The fold has to come at the two sides as shown in the diagram below. 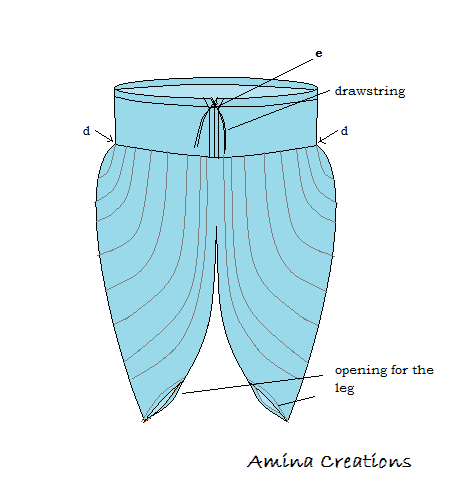 Cut a long piece of cloth for the draw string, stitch and insert the draw string through the hole in the waist band and your dhoti salwar is completed. Alternately you can also stitch elastic at the top of the waist band.